UPDATE 2: I had the GM tune that comes with the GM intake installed by the dealer today. I was not expecting much, but there is a very noticeable improvement in mid-range power and response. It seems to be stronger through the rev range, and more eager to rev. It is very noticeable, just more lively all around. I floored it on a roll in 1st and it spun the tires easily - it did not do this before. I’d love to get a dyno test, although I don’t have any before numbers. I’m not sure if peak power is improved, but it feels stronger in mid-range. Definitely worth the $375 for the CAI! UPDATE 1: Got a CEL after I drove the car some today with the CAI installed but without the GM tune (will take in in to the dealer this week for that). Code was ‘system too lean’ - which tells me this thing has less resistance than the stock system. The MAF may be reading too low since either pressure or volume is greater than stock. The tune should adjust for this. Positive sign this thing actually does something useful! Installed the GM performance air intake on the V6 Camaro today. This is an official GM part and comes with a GM tune. The intake includes a labor code for the GM tech to use to install the tune. Strangely, this intake is only approved for 16-17 V6 cars, not the 18s (at least not yet). Not sure why, maybe emissions standards? To install the tune, the tech must enter the VIN and a key is generated for the specific car. It is also recorded in the GM system that the car has been flashed. Since this is GM approved, the full warranty is intact. I’ve not been able to find any evidence of specific performance gain online. I don’t see any before and after dyno results, and there aren’t many 1/4 mile times for the V6. I’d like to know what difference it makes, but I’m not doing any before/after testing either. 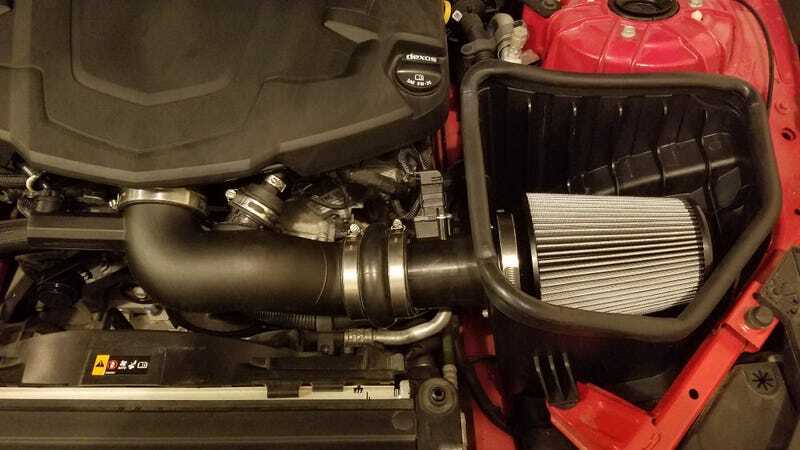 GM simply calls it a performance intake, and I think the tune must do something. If nothing else, it looks cool!